The Photos app has been redesigned more thoroughly. To begin with, the Photos tab looks better organized. Prior to iOS 7 we used to get a grid of all of photos there, sorted by date. Images are now organized by date and location, for those that have been geo-tagged. This view is called Moments, with a description always at the top, with time, place and date. The Moments view offers multiple photos selection - you can select an entire folder with just a single tap. Mass Delete, Share (including AirDrop) and Add To Album options are available. You can go a step back, to Collections view where you can better view your sorted photos into groups with labels and much smaller thumbs. Those thumbs are still clickable, you can even scroll them to find the one you're looking for (small thumbs are hard to navigate through though). A tap on a city label in Moments or Collections will take you to the old Places view, where you get a map with pins showing where exactly your photos were taken. Finally, there is the Year view. It squeezes your collection into tight grids for each year. The second tab is Shared photos - it has all your Photo streams. Photo Stream, which acts like a social sub-network, works really well and is very simple to set up. You choose what pictures to share and which people to share with. Your buddies on the receiving end will be able to like them and post comments. You can invite users you want to share your Photo Streams with via email or get invited. Finally, the third tab is albums. You get three default album types - camera roll, my photo stream and panoramas. Albums can be added, edited and deleted. Images are displayed in full size and you can delete, share or edit them. From the sharing menu you also get advanced options such as copy, assign to contact, slideshow, print, use as wallpaper and AirPlay. You can AirDrop multiple pictures from this interface as well. The photo editor is the same as before with a new option to add filters. It supports rotation, cropping, filters and red-eye removal. There's also an Enhance option too. In Edit mode five keys appear at the bottom for the available editing options. 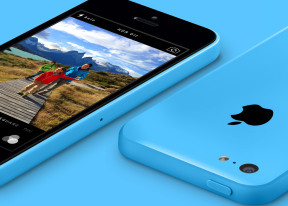 Every iPhone 5c and 5s offers you the iPhoto and iMovie apps for free. The iPhoto allows you also to organize your photos by albums and events, you can even create journals - a collage of photos you can share via iCould and make it visible to anyone. The iPhoto app has richer editing options than the standard gallery, but its UI needs to be updated to match the iOS 7 looks. Not it just looks a bit retro. Finally, the powerful iMovie editor is available for free as well, you just need to download it once you sign in on the AppStore. You can make your own movies and trailers by adding, cutting, merging, etc. videos, songs and pictures. The app is powerful and does an excellent job. Many things have changed in iOS 7 but the video player is definitely not one of them. You can upload only supported formats via iTunes or purchase videos from the iTunes store. This is an extremely disappointing showing by a platform that is supposed to excel at multimedia consumption. The lack of extra functionality is bad enough, but having to use just an extremely limited number of media format or resorting to converting files, which is both slow and inconvenient is a real deal-breaker. The iOS 7 music player is exactly the same as the one in iOS 6, its appearance is in line with the new iOS design. You can create playlists, delete songs right from within the player and reorder tabs whichever way you like. Cover Flow is gone for good replaced by the new Album view - you access it by flipping the device landscape. It lists all the covers to the albums you have in your library. Tapping on an album thumb lists all the tracks in it. The Now Playing screen hasn't changed in functionality neither is the settings. Even in its seventh major iteration iOS still fails to offer configurable equalizers. If you are logged in with a US Apple ID (the service will roll out in more countries soon), your iOS 7 music player will get an additional iTunes Radio tab. It's a music streaming service with the entire iTunes content available for streaming. The stations are divided by genres, but once you add a station, you can choose to remove artists or add more songs from an artist/group. You can preview a station before adding it to your list. In case you like a particular song, you can buy it with just one tap. History is available and you can always return to buy songs later. A Wish List is available as well. iTunes Radio is ad-free if you are using iTunes Match. Otherwise, every 7 to 10 songs are broken by about 15sec of commercials. 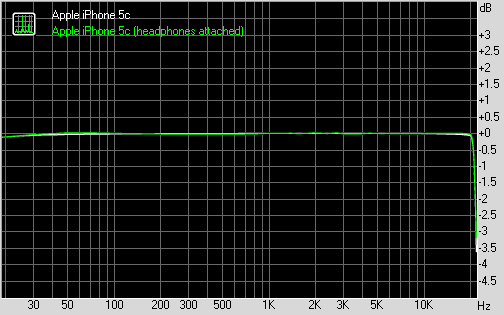 Just as expected the Apple iPhone 5c audio output was mostly identical to that of the iPhone 5. The Apple lineup was dethroned as the best in this regard over the past year by some of the Android flagships (most notably the HTC recent top dogs), but the iPhone 5c still performs admirably and will please every audiophile. In the first trial (connected to an active external amplifier), the iPhone 5c did close to perfectly. The frequency response lacks the deviations at the high end of the spectrum that we saw on the iPhone 5 so the only average stereo crosstalk levels are the only thing that's not brilliant about the smartphone's scores. Volume levels are pretty high too, although not quite as good as on the HTC One. The second part of our test told a similar story - the iPhone 5c is a great performer with high volume levels and clean output. The stereo crosstalk again isn't the best we have seen, but the rest of the readings are all impressive.